I am very humbled to be one of the “founding fathers” of the Islamic Center of Little Rock. 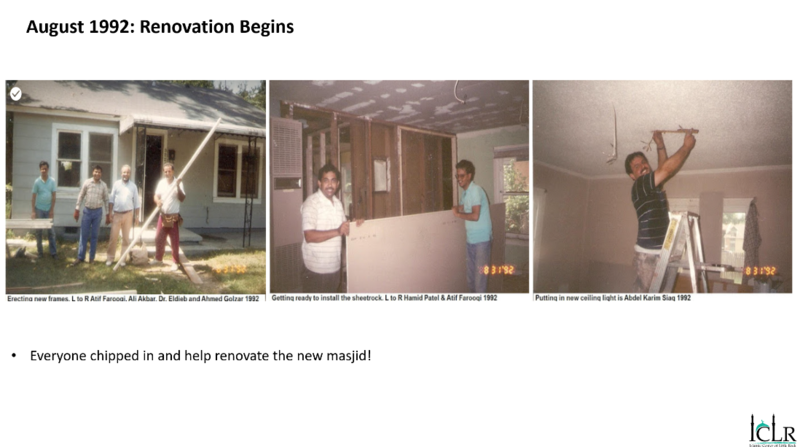 I thank Allah (swt) for giving me this great opportunity to work with a few brothers to build the Islamic Center of Little Rock, which was always one of my life’s dreams.I moved with my family from Brandon (near Jackson), Mississippi to Little Rock in September 1979. Initially, I was looking for families who could speak my native language, Urdu, since my wife and I are both originally from Hyderabad, India. I found only two other families from Hyderabad: Mohammed Hamid Hussain and Ahmed Golzar. The others were Dr. Ali U. Shaikh from Kolkata, India and Dr. Moazzam Husain from Dhaka, Bangladesh. There were only two Pakistani families, Dr. Mufiz Chohan and Dr. Fayyaz Mirza. Also, I met Abdul Hamed Patel from Gujrat, India; he was then a bachelor. In 1981, Dr. Chohan and his family moved to Newport, Arkansas and Dr. Fayyaz Mirza and his family moved to Wichita Falls, Texas. Mohammed Hamid Hussain and his family moved to Gainesville, Florida in 1986. Last year they moved to Augusta, Georgia. Ahmed Golzar and his family moved to Chicago, Illinois in 1999. Later, I learned that in North Little Rock there were four families from Palestine and one family from Egypt. In addition, there were six families from Palestine living in Jacksonville at that time. There were no mosques in North Little Rock or in Jacksonville. In addition, in 1979 there were about twenty African-American Muslim families living close to downtown Little Rock. They had established a mosque called Masjid Ameen Zakariah, which had been converted from an old movie theater and located at 1717 Wright Avenue. Brother Johnny Aleem Hasan was the Imam of that mosque. We used to attend the mosque for Juma salah as well as on some other religious occasions. A few years ago the mosque was re-named the Islamic Center of Human Excellence. In 1980, the above mentioned six families started meeting at homes each Saturday evening for the purpose of learning Qur’an and Tafseer in English, and to teach Qur’an and Hadith to our children. Br. Patel also joined our group. Our children learned Qur’an, memorized surahs, learned about Islamic values, and prayed with us. 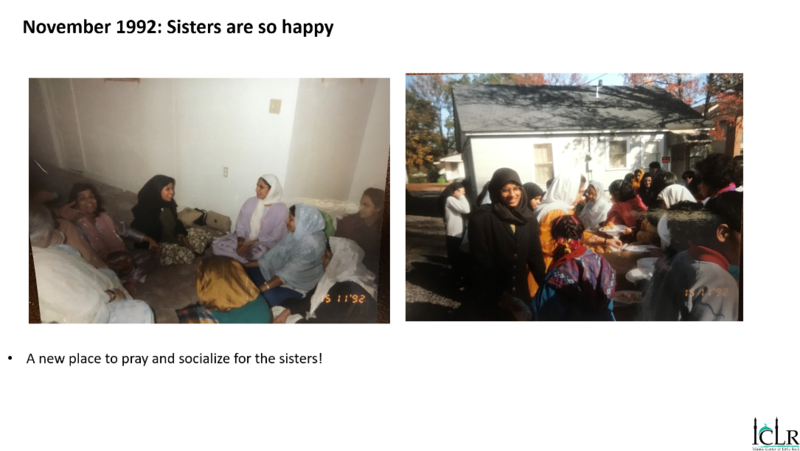 It was an opportunity for the small Muslim community to get together by having “potluck” dinners and socializing as well. Since so many of us were far from our families it felt like an extended family. 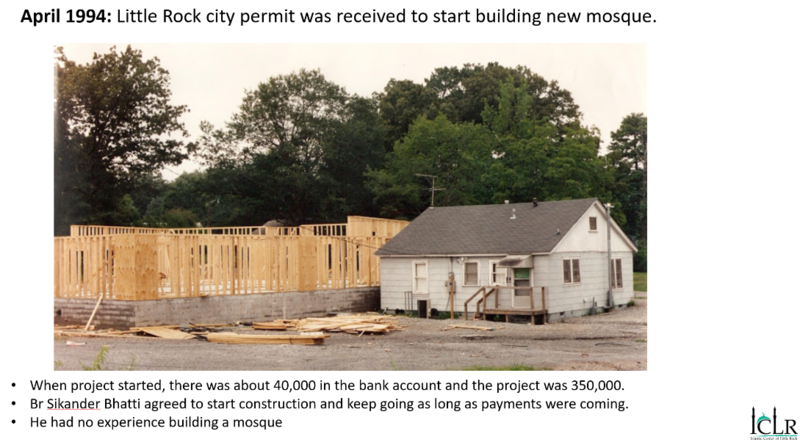 Later we came to know that there were several Muslim families and students in Pine Bluff who had established a mosque, called the Islamic Center of Pine Bluff under a new organization, the Muslim Association of Arkansas (MAA). We started attending their monthly meetings, held on the first Saturday evening of each month. 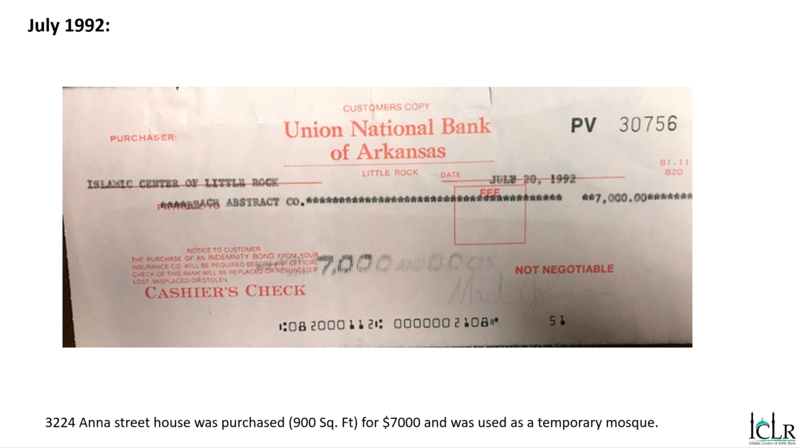 On April 14, 1984, we established the Little Rock Chapter of MAA, opened a bank account and started collecting membership fees and donations with the purpose of establishing a mosque in Little Rock. I was in charge of this Chapter and served as the Secretary of this organization for seven years. The number of Muslim families and students in Little Rock grew steadily and we were unable to accommodate them in homes for our religious gatherings. During that time, Johny Aleem Hasan and I were also participating in an interfaith dialogue between Jews, Christians and Muslims sponsored by the Second Presbyterian Church of Little Rock. Since we were a non- profit religious organization (MAA at Little Rock) the members of the Church offered us their Sunday school rooms located in the basement of their church for free, which we gladly accepted. We are very thankful to them for their generosity. We conducted our first monthly meeting at this facility on May 11, 1985. We also participated in the Interfaith Thanksgiving events and also spoke at local churches and schools about Islam. After attending the annual ISNA (Islamic Society of North America) convention, we learned about the importance of creating Muslim youth groups and started our own chapter of MYNA (Muslim Youth of North America). In the late 1980s, UALR (The University of Arkansas at Little Rock) started a Computer Science degree program. About one hundred students from Saudi Arabia and other Middle Eastern countries were enrolled in this program. With the help of Br. Ali Shaikh, a professor at UALR, we got the approval to pray Juma salah in the two basement rooms of the Administration South building at UALR. 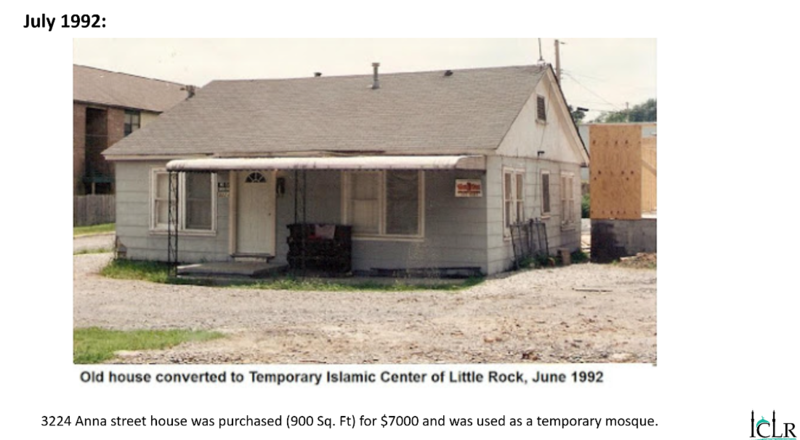 On January 16, 1992, the organization named “Muslim Association of Arkansas, Little Rock Chapter” was dissolved and a new organization named “Islamic Center of Little Rock” was started. The ICLR Constitution was adopted on May 8, 1992 and the organization was incorporated as a domestic non-profit corporation in the state of Arkansas on May 20, 1992 by the Secretary of State, W. J. “Bill” McCuen. The Employer Identification Number (EIN) for ICLR was obtained on June 1, 1992, in order to handle financial matters. In June 1992, we bought a small house (900 Sq. 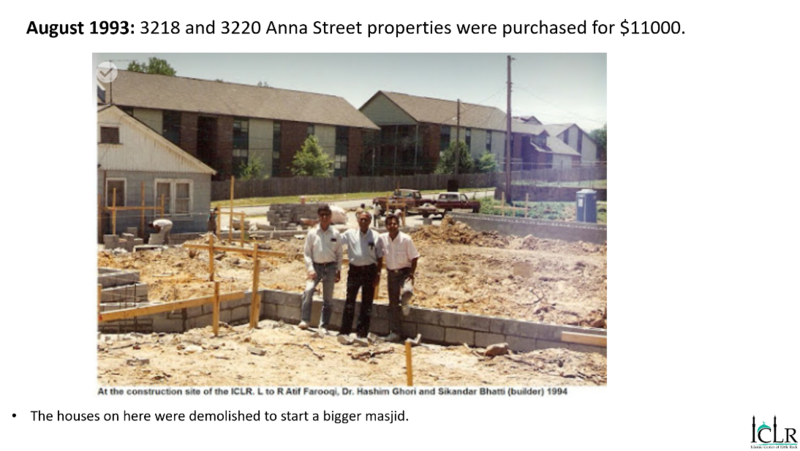 Ft; 50 feet X 150 feet) located at 3224 Anna street near UALR and South Oak Apartment complex for $7,500 and established the temporary ICLR mosque, Alhamdulillah. I was fortunate enough to locate the property about a block from UALR across Fair Park Boulevard. Brother Ahmad Golzar negotiated the price of the property and we paid cash to the owner. The donations were collected from our small community. The location was ideal because there were many Muslim students from the Middle East who were enrolled at UALR. This mosque was a convenient location for them to offer their daily prayers five times a day as well as the Jum’a salah. With the help of student volunteers and the men from our small community, we converted this house into a mosque. Brothers Hamed Patel, Ashraf Khan, Abdul Kareem Siag, Abdul Majeed Seraj, Ali Akbar, Ali Shaikh, Atif Farooqi, Ahmad Golzar, Mohammad Eldeib, myself and many others volunteered in building the mosque, even though most of us had never done so before. 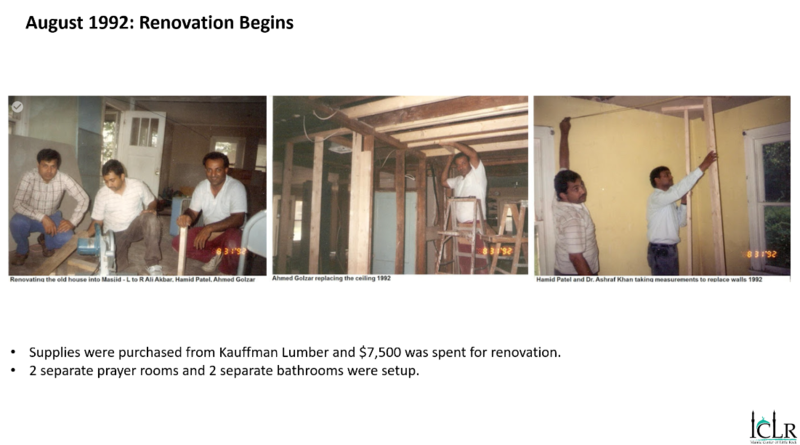 We purchased our supplies from the nearby Kauffman Lumber and spent another $7,500 for renovation. This house had two separate prayer rooms for men and women with two separate bathrooms. 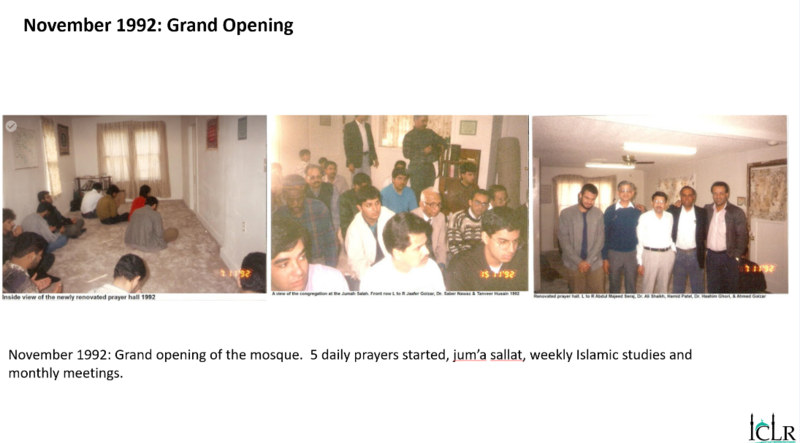 We had the opening ceremony of our temporary mosque on November 14, 1992. Dr. Mufiz Chohan, an ex- member of ICLR Board of Trustees, was the speaker at this historical occasion. For the first time, we started five daily prayers, Jum’a salaat, weekly Islamic studies for our children and adults at this small mosque. We also conducted our monthly meetings on the second Saturday of each month at this mosque. Some of the sisters in the community, Sister Raeda Barakat, Sr. Sakinah Abdul Majeed, Sr. Huma Aslam, and Sr. Saba Ghori started weekend and summer Islamic school classes for the kids where they taught Arabic, Islamic History, and Islamic Morals and Ethics. In December 1992 we transferred this property to NAIT (North American Islamic Trust) which is a national trust organization, an affiliation of ISNA (Islamic Society of North America). We thought it would be necessary to seek the affiliation in case we fail to carry on the Islamic activities due to financial constraint or other reasons. With the assistance of Br. 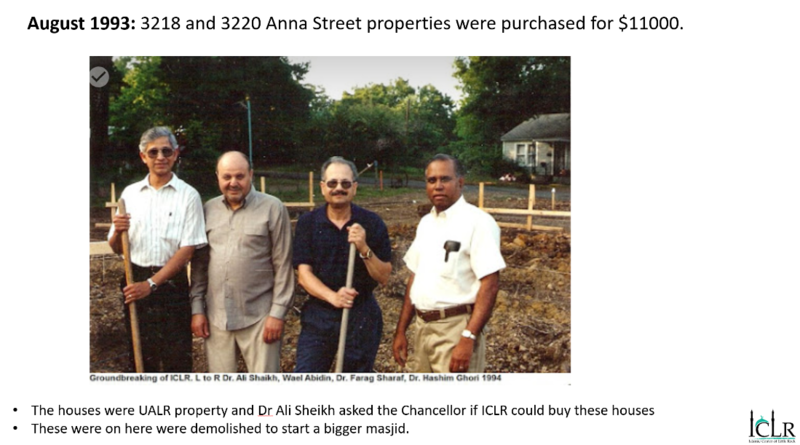 Ali Shaikh, a Chemistry professor at UALR and a past President and past member of the Board of Trustees of ICLR, we purchased two adjacent vacant houses (3218 and 3220 Anna Street) from UALR in August 1993 for $11,000. These two houses were demolished and later the small house (temporary mosque) was also demolished. These three lots gave us a total area of 165 feet x150 feet. 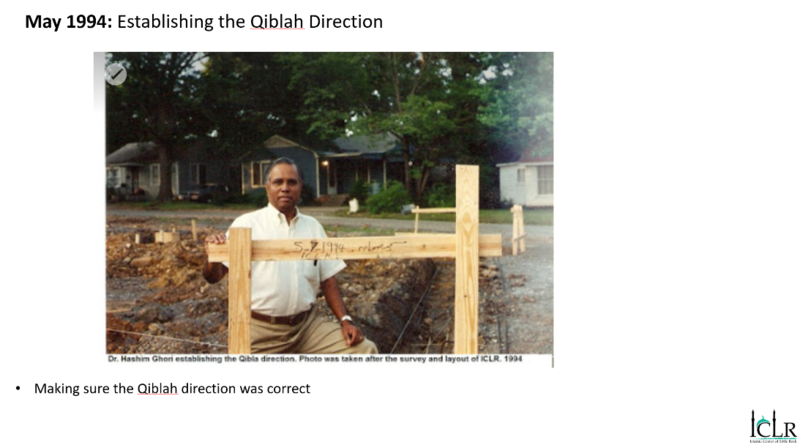 A new Islamic Center of Little Rock (ICLR) was built on these three lots. The properties were also transferred to NAIT. 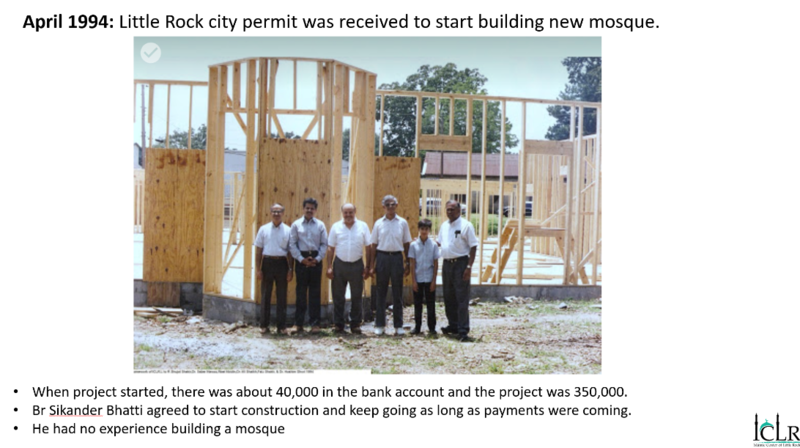 We requested the city of Little Rock for a permit for constructing the new building of ICLR (the present mosque building). Alhamdulillah, we received the permit on April 4, 1994. 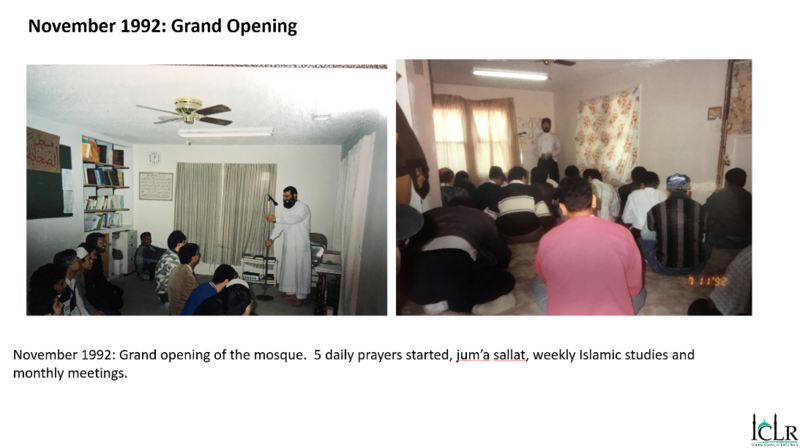 The new ICLR has a total area of approximately 5563 square Feet, about 2400 square feet of prayer hall, with separate prayer areas and separate wudu areas for brothers and sisters and a kitchen. 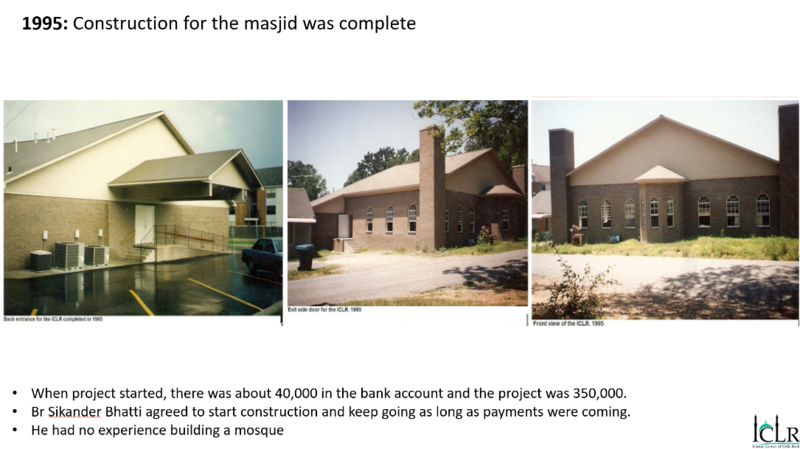 When the construction of the mosque building began in 1994, we had about $40,000 in our account and the estimated cost of the project was about $350,000. We could not borrow the needed money from the bank, because it is not allowed in Islam to borrow money that demands interest payment for building a mosque. We approached a member of the community, Br. Sikandar Bhatti (ABCO builders) who had experience in house construction but no experience in building a mosque. Alhamdulillah, he agreed to start the construction. He also agreed that, as long as we keep on bringing the money the construction will go on. The fund raising efforts began. Dr. Mufiz Chohan gave us a list of Pakistani doctors practicing in the USA and we sent them letters appealing them to donate money for our project. Donations started to come in. We had a booth in the bazaar at the ISNA convention in September 1994 which was held in Chicago. I sold candy and scarves, and raised $2,000. We distributed pamphlets at the booth with a request for donations for our project. Brothers Farag Sharaf, Wael Abdin, Ali Shaikh, Faizul Hanif, Hamed Patel, Atif Farooqi, Mahmood Jhilati and myself traveled to Pine Bluff, Jonesboro, Memphis, Tulsa, Dallas, Irving, Richardson, Houston, Colombia (Missouri) and Atlanta on Fridays and collected donations. Also, Hamed Patel visited London (UK) and collected money for our project. Students from the Middle East also donated funds for our project. Several sisters organized community garage sales and bake sales in Little Rock and Pine Bluff in order to collect funds. 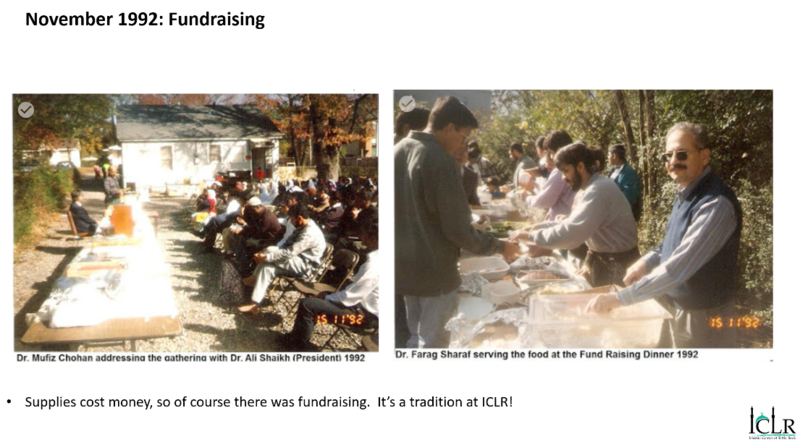 At the occasion of Eid-ul-Adha, on May 13, 1995, we conducted our first fund raising dinner at the Donaghey Student Center of UALR. 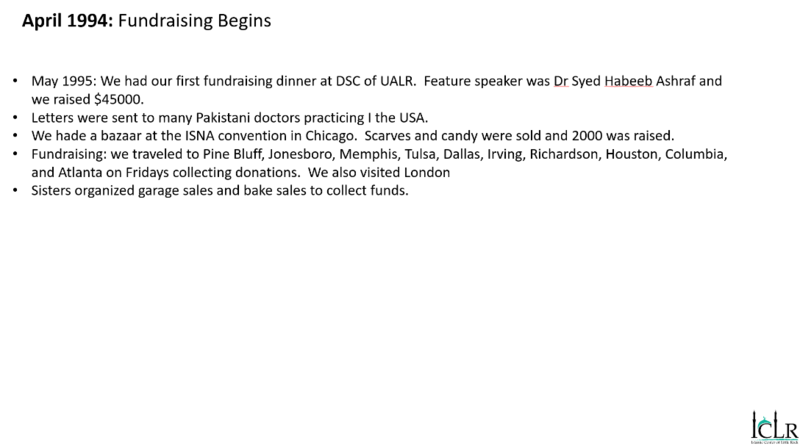 The featured speaker was Dr. Syed Habeeb Ashraf of Baltimore, Maryland who was known as a great fundraiser. He raised about $45,000 ($15,000 in cash and $30,000 in pledges). The Islamic Society of North America (ISNA) also endorsed our project for fund raising. We had to borrow about $25,000 from NAIT for finishing the parking lot, which we paid back within a couple of years after the project was completed. Br Mohammed Shaher, a talented builder, agreed to build the mimbar, mahrab and podium free of cost. He also finished the parking lot. 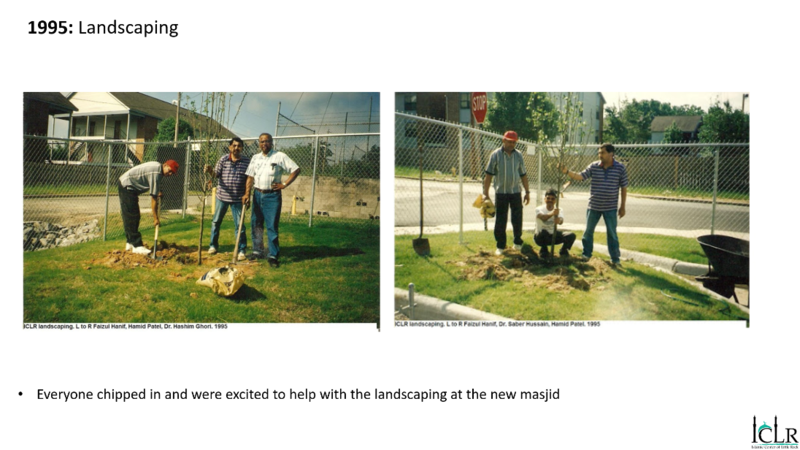 Alhamdulillah, the construction of the Islamic Center was completed in December of 1995. 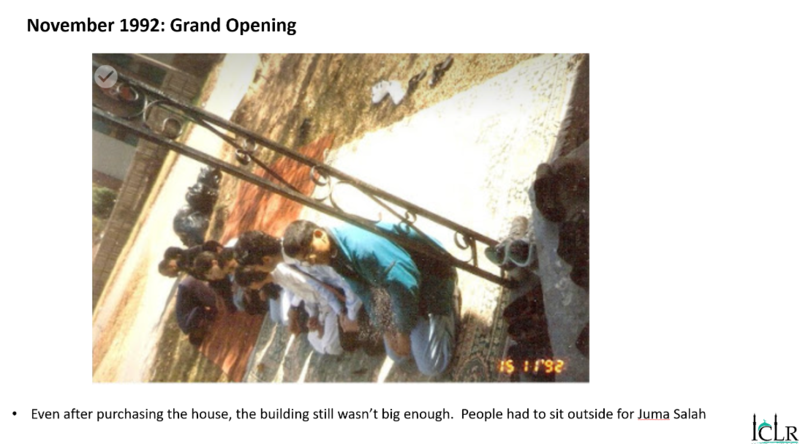 The grand opening was held on January 13, 1996 by Imam Mujahed M. Bakhach of Forth Worth, Texas. Hafez Yakoob Shareef, Imam of Islamic Society of Northwest Suburbs (ISNS) of Rolling Meadows, near Chicago recited the Qur’an at this occasion. Our builder Br. Sikander Bhatti deserves lot of credit for agreeing to start the construction when we were only able to pay him $40,000. We had excellent cooperation from the Muslims of the greater Little Rock area as well as from the Pine Bluff Muslim community. After completion of this masjid, Br. Sikander Bhatti moved to Mansfield, Texas and later we learned that he passed away on November 1, 2014. May Allah give him the highest place in jannah for taking up this task and building the masjid. I would like to thank all those who supported, donated, and worked hard for building this beautiful mosque. I also thank Allah for giving us this wonderful opportunity to build our first Islamic Center in Little Rock from the ground level. May Allah accept all of our efforts. Ameen. If I have made a mistake in not recognizing any individual or organization, please forgive me. The names of those brothers who helped us in renovating the old house are listed under their photos. 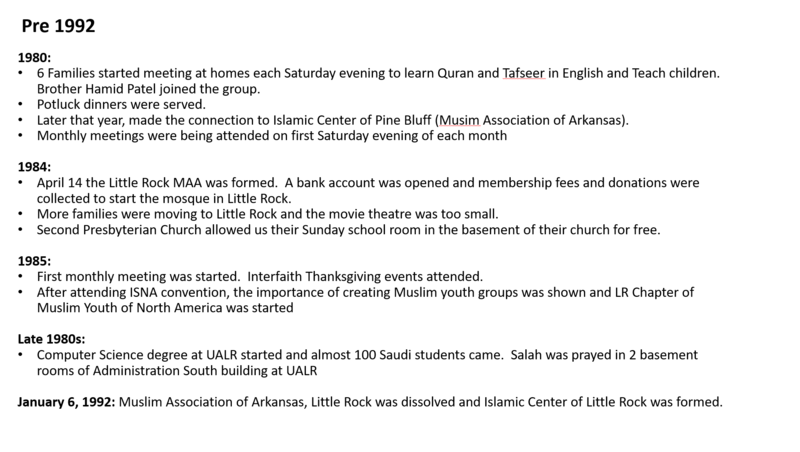 Please see the 26 photos associated with the various activities of the Islamic Center of Little Rock.